Starting Monday, September 17, 2018 demolition work will begin to remove portions of the precast concrete exterior panels. 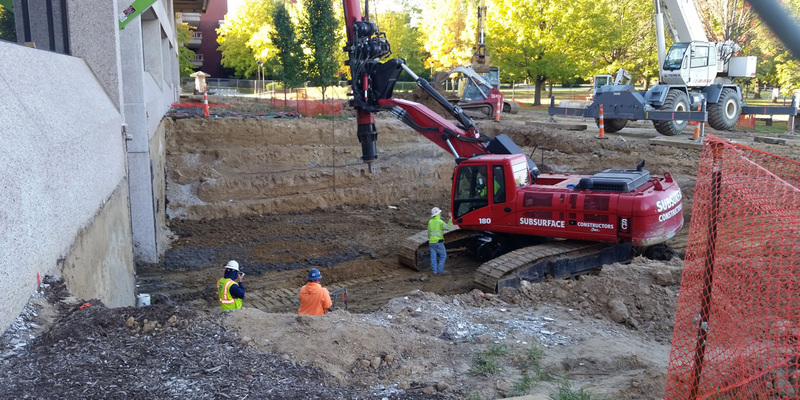 The following week around 9/24 large drill rigs will begin excavation for the new structural piers on the west side of Founders Hall. During this same week demolition is to start on the East stair towers as well. Access between Founders Hall and Alumni Hall to Parking LOT A will remain with an opening in the construction fencing, but will be periodically closed as construction progresses, cutting off direct access to Lot “A”. During these times, Parking Lot “A” may be reached through the north entrance to Alumni Hall and south entrance to Founders Hall. Access to Founders Hall is restricted to the lower level and 1st floor as only authorized construction personal may access the 2nd and 3rd floors during the first phase of construction.